One of the most highly popular models for Toyota in emerging markets including Malaysia, the Rush has been a success story for Toyota owing to its strong attributes. With this new current generation model, the Toyota Rush has grown bigger in size to seat seven adults with ease, thus increasing its practicality. At the same time, it has become much sharper and aggressive to look at, compared to the erstwhile bland model. Blending in the rugged appeal of an SUV and practicality of an MPV, the Rush even features a revised interior layout which comes with additional modern features to make it suitable to the interest of younger buyers. The engine powering the Toyota Rush is a 1.5-litre four-cylinder petrol engine, which produces 105 PS of maximum power output and 135 Nm of peak torque output. The engine gets a simple 4-speed automatic gearbox as the only transmission option, as of now. Have a question on Rush? Rush is available in 5 different colors - White, Blue, Titanium Silver, Dark Grey and Metallic Green. Introduced first as the Daihatsu Terios, the Toyota Rush has been the go-to compact SUV in the Southeast-Asian auto industry from quite some time. The evolution of the Rush from being a 5-seater to a compact SUV that can fit in 7 people has been remarkable. There is a new 1.5-litre naturally-aspirated four-cylinder petrol engine with auto start/stop in the new Rush. With Toyota’s latest 360-T (Trust & Technology), the 2018 Toyota Rush is full of features and is available in 5 different paint schemes. 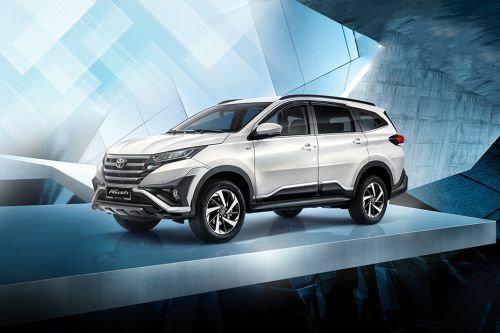 Starting at RM 93,000, the Rush will take on the Honda BR-V in the Malaysian market. With everyone complaining about the dated interior of the last-gen Rush, Toyota has listened to the prayers and given the interior of the 2018 Rush a reconstruction. Instead of looking dated, the new updated interior now looks more symmetrical and is of contemporary design. The interior that is majorly black in color is very well complemented by silver and chrome accents. The leather upholstery adds to the premium touch. Toyota has followed the similar approach as before and the seating arrangement in the new Rush is the same 2:3:2. The middle row seats are of 60:40 split type with the third-row displaying 50:50 configuration. There ample of space at the back, i.e., 217-litre when the third row backrest is folded down and 514-litre when tumbled up. Taking care of the cooling department is a single-zone air-conditioner with rear-vents for the passengers sitting at the back. There are a total of 13 cup-holders for the convenience along with 4 electric outlets. The infotainment system is a 6.8-inch DVD-AVX head unit with screen mirroring function and 6 speakers. You also get features like Toyota AutoTag built-in SmartTAG, keyless entry and start, and digital video recorder (DVR). The steering wheel is a 3-spoke one with audio controls mounted on it. The instrument console comes with analogue speedo and tacho along with digital indicators for fuel, and others. The 2018 Toyota Rush is a completely different looking vehicle than the last-gen model. The exterior has been redesigned, and it now gives the Rush a muscular and appealing look. The front end of the new Rush is inspired from the bigger sibling, the Toyota Fortuner. Sitting between the slim LED headlamps and notched indicators along with LED DRLs is a tapered, four-slat grille. Looking below the headlamps and the grille, you see circular fog lamps, faux inlets, and intake in the centre. A fresh “X-Design” is formed with the combination of the blacked-out and body-colored areas. When viewed from the side, the body cladding on the 2018 Rush adds to its MPV-SUV look. There is also a crease that starts from the front and goes all way to the back before converging near the tail lamps. The 17-inch alloy wheels fitted with 215/60 tyres further enhance the rugged appearance. At the rear, the number-plate is placed on the tailgate. The taillights are of wrap-around type and are met by black window trims. Along with more cladding at the back, there’s also a skid-plate present like at the front. And for precise dimensions, the 2018’s offering by Toyota measures 4,435 mm long, 1,695 mm wide, 1,705 mm tall with a wheelbase measuring 2,685 mm. With its capabilities of conquering all kinds of battlegrounds, the Rush comes with MacPherson strut with coil spring and stabiliser bar up front and 5-link with coil spring and lateral od at the rear. Presence of an all-electric power steering makes sure there are no hiccups while maneuvering the SUV-MPV crossover. The Rush gets regular ventilated disc brakes at the front with drum brakes handling the responsibilities at the rear. The 2018 Toyota Rush gets a 2NR-VE 1.5-litre naturally-aspirated four-cylinder petrol engine with automatic start/stop function. It is the same mill that you can find under the hoods of the Avanza and the Perodua Myvi. For better fuel efficiency, Toyota has added dual VVT-i. The new mill produces 105 PS at 6,000 rpm and 136 Nm of peak torque at 4,200 rpm while giving 15.6 kmpl of fuel efficiency. A four-speed torque converter automatic is assigned to deliver the power to the rear wheels. After all the major overhauls in every single department of the vehicle, Toyota has left no stone unturned in making sure the 2018 Rush is as safe as ever. The long list of safety features includes ABS, EBD, Brake Assist, Emergency Stop Signal, Vehicle Stability Control, Traction Control, Hill-Start Assist, Blind Spot Monitor, Rear-Cross Traffic Alert, and Pre-Collision system. Adding to all these features are Parking Sensors (front and rear), Auto Door Locks, 6 SRS Airbags, and ISOFIX Child Safety Mounts. Not to forget, the Rush also packs in an Immobiliser, Cabin Sensor, and a Siren with backup battery. Plus, a 5-star ASEAN NCAP safety rating puts that extra cherry on the cake. A new and great design, that not only is rugged but looks attractive as well has put in a new life altogether in the 2018 Toyota Rush. Complementing the new looks is a fuel-efficient engine suited for all kind of roads. And with the dated interior finally updated with a contemporary one, the Rush is back, and that too big time. Go with the family for a shopping stint in the city or take them for an adventure in the countryside, the Rush is the mate you’d love to have along. What are the Safety Features Available in Toyota Rush?